is professor of political science and adjunct professor of American studies at Indiana University in Bloomington. His most recent book is Faces of Moderation: The Art of Balance in an Age of Extremes (2016). He lives in Bloomington. Three centuries ago, the French political philosopher Montesquieu claimed that human beings accommodate themselves better to the middle than to the extremes. Only a few decades later, George Washington begged to differ. In his Farewell Address (1796), the first president of the United States sounded a warning signal against the pernicious effects of the spirit of party and faction. The latter, he argued, has its roots in the strongest passions of the human mind and can be seen in ‘its greatest rankness’ in popular government where the competition and rivalry between factions are ‘sharpened by the spirit of revenge’ and immoderation. If one looks at our world today, we might be tempted to side with Washington over Montesquieu. Our political scene offers a clear sign of the little faith we seem to have in this virtue without which, as John Adams memorably put it in 1776, ‘every man in power becomes a ravenous beast of prey’. Although our democratic institutions depend on political actors exercising common sense, self-restraint and moderation, we live in a world dominated by hyperbole and ideological intransigence in which moderates have become a sort of endangered species in dire need of protection. Can we do something about that to save them from extinction? To answer this question, we should take a new look at moderation, which Edmund Burke regarded as a difficult virtue, proper only to noble and courageous minds. What does it mean to be a moderate voice in political and public life? What are the principles underlying moderation? What do moderates seek to achieve in society, and how do they differ from more radical or extremist minds? Before answering these questions, we must address the common view that tends to equate moderation with indecision, weakness, opportunism and cowardice. In the eyes of those who espouse this interpretation, moderation appears as a bland, incoherent and undesirable virtue, the opposite of the firmness and clarity of purpose desired by those who prefer starker contrasts and brighter colours. ‘Moderation sees itself as beautiful,’ Friedrich Nietzsche once quipped, only because ‘it is unaware that in the eye of the immoderate it appears black and sober, and consequently ugly-looking.’ To others more politically inclined, moderation is unsatisfactory because it is seen as a form of appeasement that does not offer a suitable platform for mobilisation and reform. What did the ancients think about all this? For one thing, they didn’t share our present skepticism toward moderation. On the contrary, they praised it and thought that the alleged ‘barbarians’ were also incapable of moderation, that is, of following a rational middle course. If classical authors agreed on the importance of moderation, they also insisted that it is not an easy virtue. Tacitus called it, in fact, ‘the most difficult lesson of wisdom’, while Horace linked moderation to the golden mean and balance, all good things in his view, but difficult to achieve in practice. Plato highlighted both the importance and difficulty of moderation in The Republic, where he defined it as the virtue that allows us to control or temper our passions, emotions and desires. For all their differences, Plato’s wisdom was not lost on his most important disciple, Aristotle. In the Nicomachean Ethics, he defined virtue as a mean between extremes, and insisted that ‘a master of any art avoids excess and defect’, always seeking ‘the intermediate’ that preserves order and freedom in society. Yet since the mean is never one-dimensional, we must always assess and evaluate the context of our choices in order to decide on the appropriate course of action at the ‘right’ time, in the ‘right’ place, and with regard to the ‘right’ people. To achieve all this, one needs both prudence and moderation, yet there is no algorithm for them; moderation can be learned and gained only through experience and practice. It is a challenging virtue, not suitable to the young who lack knowledge and patience. Moderation as temperance also occupies a key place in the Christian tradition, in which it has long been regarded, along with prudence, as a cardinal virtue. Many Christian theologians, including St Thomas Aquinas, argue that moderation is not incompatible with fortitude, courage and wisdom. In fact, they claim, no one can be wise and courageous without also being moderate at the same time. For Aquinas and others, what is moderate and temperate coincides with what is good. As such, moderation appears as ‘the silken string running through the pearl-chain of all virtues’, to use a beautiful image from the 17th-century English author Joseph Hall. In the footsteps of the ancients who equated moderation with practical wisdom, Montesquieu argued in The Spirit of the Laws (1748) that moderation is the supreme virtue of the legislator while also insisting that moderation is much more than the proverbial golden mean between the extremes. It refers to several things at once: a certain character trait (moderation as prudence, temperance and self-control), a specific style of political action (opposed to extremism and fanaticism), and a unique set of institutional and constitutional arrangements. The institutional dimensions of moderation came clearly to the fore in The Federalist Papers (1787-88), whose authors referred to Montesquieu on numerous occasions as ‘the oracle’. James Madison, Alexander Hamilton and John Jay understood that liberty and prosperity in any state depend on the existence of a wise balance between groups and classes in society, as well as on a wise architecture of power that includes balance/separation of powers, federalism, judicial review and bicameralism. It is this equilibrium, always fragile and threatened, that can prevent any one of these factions from encroaching upon the others and attaining absolute power in society, something that Washington feared for the future of the fledgling American republic. These champions of moderation remind us that the latter constitutes a coherent and diverse tradition of thought that forms an archipelago yet to be fully explored. Moderation, they teach us, is much more than a simple trait of character, a certain state of mind, or a disposition. In addition to its ethical meaning, it also has a distinctively political vision and a certain style of political action that includes civility and a form of eclecticism, the opposite of ideological purity. Moderates are aware of the relative validity of their own political convictions and of their imperfect knowledge and information. That is why they prefer to think ‘politically’ rather than ideologically, and see the world not through Manichaean lenses, in black-and-white or ‘us-versus-them’ contrasts but in many shades of grey. Moderates refuse to define one single best way and do not seek to find a definitive solution to intractable problems but are prepared instead to reach reasonable compromises whenever possible. As ‘trimmers’ who lack a narrowly defined ideology, they are content to adjust the sails of the ship of the state in order to prevent it from capsizing in times of crisis. As such, moderation is a complex balancing act, not unlike the art of walking along a thin wire or rope. The cover of my latest book, Faces of Moderation: The Art of Balance in an Age of Extremes (2016), features a funambulist. 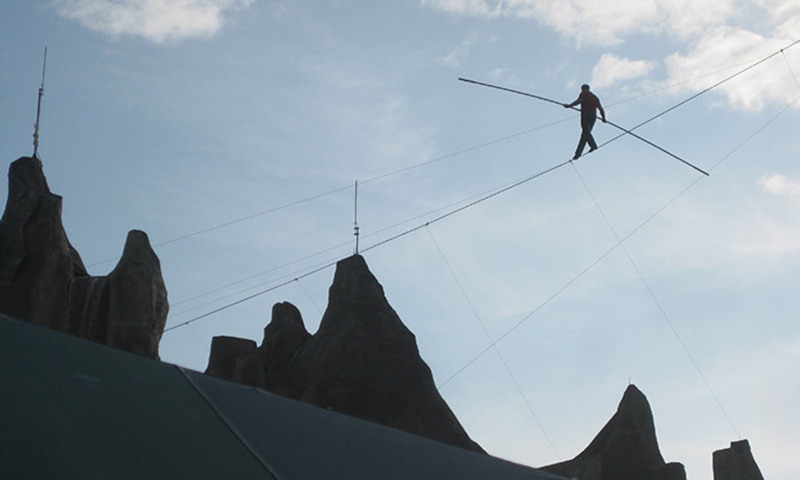 A tightrope walker needs many things to avoid falling: skills, training, patience, determination, vision, courage, art, foresight and intuition. He or she can neither go backward nor stand still. The only possible direction is forward. For that, he or she must have a vision of the final destination and never lose sight of it, while paying due attention to every step, knowing that each miscalculation can be fatal. An able politician, I believe, resembles a good funambulist: he or she needs balance in all respects, must be prudent, alert and quick to react, and should have good intuition and a sense of direction. He or she must also have the courage to swim against the current when needed, and should always demand that the other side can also be heard on any controversial topic. The opposite is the person who knows the answers even before any questions are asked, someone who is not interested in listening, and divides the world between the forces of the good and those of evil, between friends and enemies. We have too many examples of these self-righteous spirits in our age of growing immoderation. To successfully fight against them, it is high time that we rediscover a virtue – moderation – in which, as David Hume put it so well in the 1750s, ‘we are most likely to meet with truth and certainty’. Moderation can be a successful fighting creed that keeps the dialogue open with all those who are committed to preserving the basic values of our democratic society.